Available in a unique 51mm Reuleaux Triangle shaped highly polished stainless steel or two tone case. A choice of 3 beautiful mother of pearl dial options, smokey grey; white with either silver or gold coloured raised numerals. 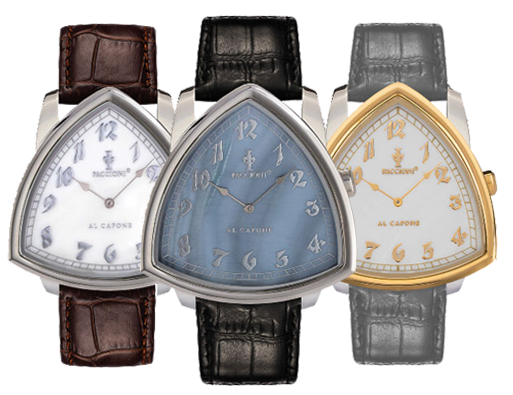 The Al Capone keeps perfect timing controlled by a precision Swiss Quartz movement. Select your desired watch and we will offer you a second strap absolutely free so you can easily interchange your genuine leather straps with a choice of black, navy, elephant grey and brown to suit your mood or outfit. All watches come presented in a ‘tommy gun’ style black leatherette violin presentation case. The Paccioni ‘Grande’ Al Capone 51mm has 12 combinations to choose from. Available in unique 44mm Reuleaux Triangle shaped highly polished stainless steel, two tone cases and also gold plated and steel case set with 70 crystals. 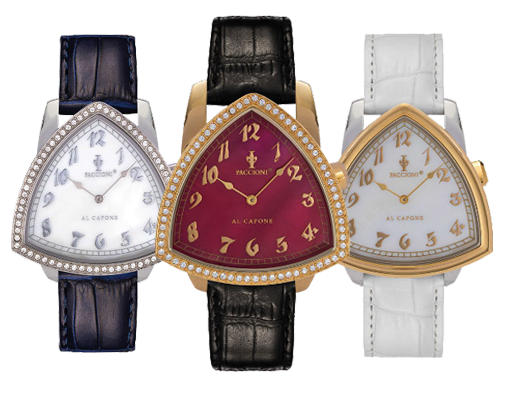 A choice of 3 beautiful mother of pearl dial options, speakeasy red; white with either silver or gold coloured raised numerals. The Al Capone keeps perfect timing controlled by a precision Swiss Quartz movement. Select your desired watch and we will offer you a second strap absolutely free so you can easily interchange your genuine leather straps with a choice of black, navy, light grey and white to suit your mood or outfit. All watches come presented in a ‘tommy gun’ style red leatherette violin presentation case at no extra charge. The Paccioni ‘Medio’ Al Capone 44mm has 24 combinations to choose from. ‘Bellagio Europe specialise in High Quality products of a collectable nature which include; Timepieces, Deluxe Pens, bespoke Fashion jewellery, Leather goods and VIP audio accessories. Our motto is “nothing is a problem”.